Devi (Chennai, India) on 25 April 2014 in Plant & Nature and Portfolio. The same cart had these too. Very nice composition, colors are gorgeous. I can already imagine the meals prepared with these peppers. Great shot. @Doug: Thank you Doug. But these weren't very fresh...tomorrow you'll see very very freshly plucked red ones!! Lovely crisp shot - all the colours of the rainbow in that cart! with beautiful colors & lighting! @omid: You are absolutely right Omid..these are hot and spicy!!! I L O V E chilis!! Great framing ! I suppose these ones so red are too spicy for me !! These look hot, Devi --- I might get sme hot ones for Harald and I go for the green !!! My throat is already on fire!! Great capture of these chillies as they fill the frame nicely with this beautiful color! Another wonderful shot! Excellent tones. Red makes them look even hotter! Excellent capture over the entire frame. Very well done. 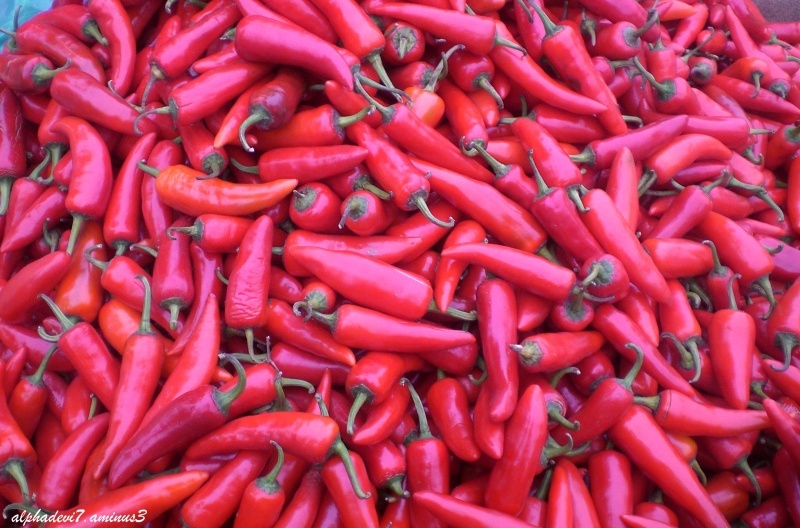 Beautiful frame filled with these Red hot chillies, Devi. A great spicy series. You plan to have a fresh red tomorrow and perhaps a near white the next day. Love to look at these spicy chillies. Good colour for a silk saree design. The red ones really pop off the screen! I prefer these .....beautiful color.